Maybe you’re reading this caption while drinking a coffee. As you stir your drink with a spoon, vortices are produced in the liquid that decay into smaller eddies until they disappear entirely. This can be described as a cascade of vortices from large to small scales. Furthermore, the motion of the spoon brings the hot liquid into contact with the cooler air and so the heat from the coffee can escape more efficiently into the atmosphere, cooling it down. A similar effect occurs in space, in the electrically charged atomic particles – solar wind plasma – blown out by our Sun, but with one key difference: in space there is no air. Although the energy injected into the solar wind by the Sun is transferred to smaller scales in turbulent cascades, just like in your coffee, the temperature in the plasma is seen to increase because there is no cool air to stop it. How exactly the solar wind plasma is heated is a hot topic in space physics, because it is hotter than expected for an expanding gas and almost no collisions are present. Scientists have suggested that the cause of this heating may be hidden in the turbulent character of the solar wind plasma. 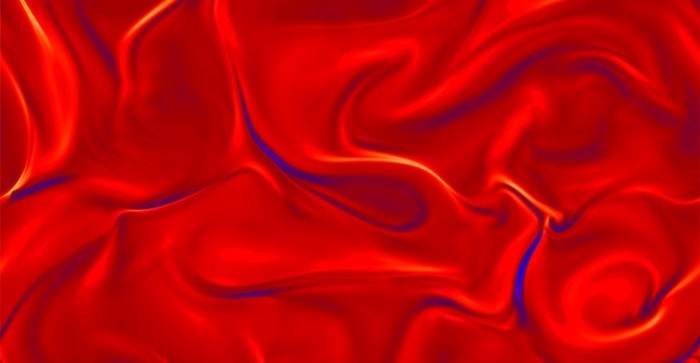 Advanced supercomputer simulations are helping to understand these complex motions: the image shown here is from one such simulation. It represents the distribution of the current density in the turbulent solar wind plasma, where localized filaments and vortices have appeared as a consequence of the turbulent energy cascade. The blue and yellow colors show the most intense currents (blue for negative and yellow for positive values). These coherent structures are not static, but evolve in time and interact with each other. Moreover, between the islands, the current becomes very intense, creating high magnetic stress regions and sometimes a phenomenon known as magnetic reconnection. That is, when magnetic field lines of opposite direction get close together they can suddenly realign into new configurations, releasing vast amounts of energy that can cause localized heating. Such events are observed in space, for example by ESA’s Cluster quartet of satellites in Earth orbit, in the solar wind. Cluster also found evidence for turbulent eddies down to a few tens of kilometers as the solar wind interacts with Earth’s magnetic field. This cascade of energy may contribute to the overall heating of the solar wind, a topic that ESA’s future Solar Orbiter mission will also try to address. In the meantime, enjoy studying turbulent cascades of vortices in your coffee! Supercomputers the world over are supported by public and private funding. The supercomputer(s) involved should be credited. Please correct this shortsightedness and come back with a completed article. The is from a 2012 ESA article. Why are you displaying it now?